This is a quickie post about a show that I've done two years in a row now that happened on Sept. 19th - Fashions From The Dark Side! 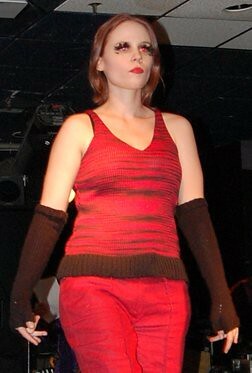 You can see more photos of other designers' fashions and the event itself on my blog and at Mike Estes' Myspace page. This event is only once a year, but it's part of a weekly night at the Asylum in Portland, ME, called Plague. If you have even a passing familiarity with, say, NIN or Bauhaus, think black is pretty cool, and like to dance, you should check it out. Those black pants are HOT!!! Love them! Great Photos on the models. The pants are awesome with the shear fabric on the back.